It looks like the legendary trade between UFC and ONE Championship might happen soon. If Demetrious Johnson goes to fight in Asian promotion, Ben Askren will finally get a chance to come face to face with big names. He has recently mentioned that he aims Colby Covington for his first fight. “Askren” also stated he expects Tyron Woodley will destroy “Chaos”. But don’t worry, Colby Covington almost immediately replied to Askren’s Twitter callout. Ben Askren has a perfect score of 18 wins and one no-contest. The former Bellator and ONE Welterweight champion defeated Nick Thompson, Douglas Lima, and Shinya Aoki. He has even won dangerous Andrei Koreshkov. But he has never fought a UFC legend before. Colby Covington (14-1 MMA, 9-1 UFC) had few notable fights under his belt. He defeated Dong Hyun Kim at UFC Fight Night 111 on June 17, 2017, via unanimous decision. Demian Maia also lost to Covington at UFC Fight Night 119 on October 28, 2017. In his last fight, he faced Rafael dos Anjos at UFC 225 on June 9, 2018. Covington won UFC Interim Welterweight title by defeating “RDA” via unanimous decision after five rounds. He even had a photo session with Donald Trump inside the White House later! 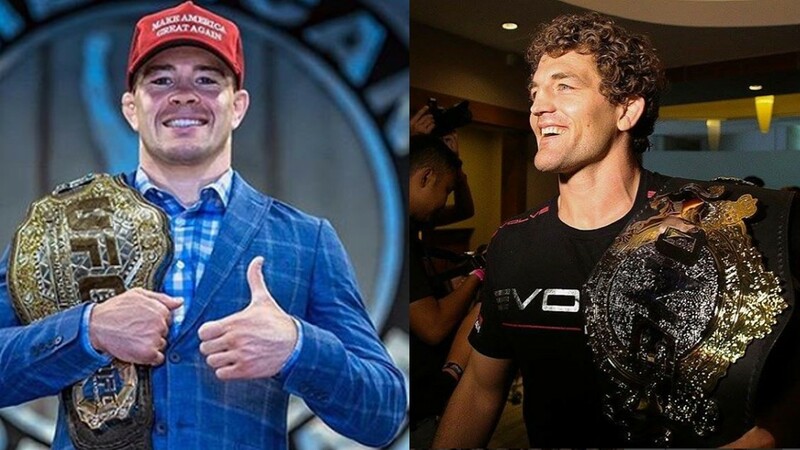 What do you think, can Ben Askren be the first guy to knock Colby Covington out? “Chaos” had his only defeat at UFC 194 on December 12, 2015. Warlley Alves finished him via first-round guillotine choke.